This project is a fun one! It's a 24-day countdown project that's perfect for any occasion, but works particularly well for Christmas! This project is quite large and measures 16.5"x6". Silhoeutte CAMEO compatible. Assembly video: https://www.youtube.com/watch?v=qGSYubGmfYY&list=UUQMqZC2PDqv-XmCd_1yhmpg. 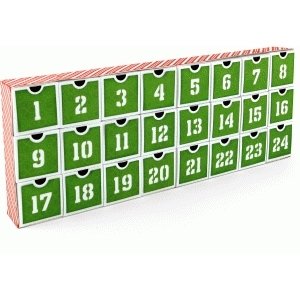 Fill each box with candy, small gifts, or notes to open each day.